There’s a whole lot of good stuff about the Favorite Kid getting married off, the first being that now I have two Favorites. And grand dogs. Two of those in the family now, too. An embarrassment of riches, y’all. 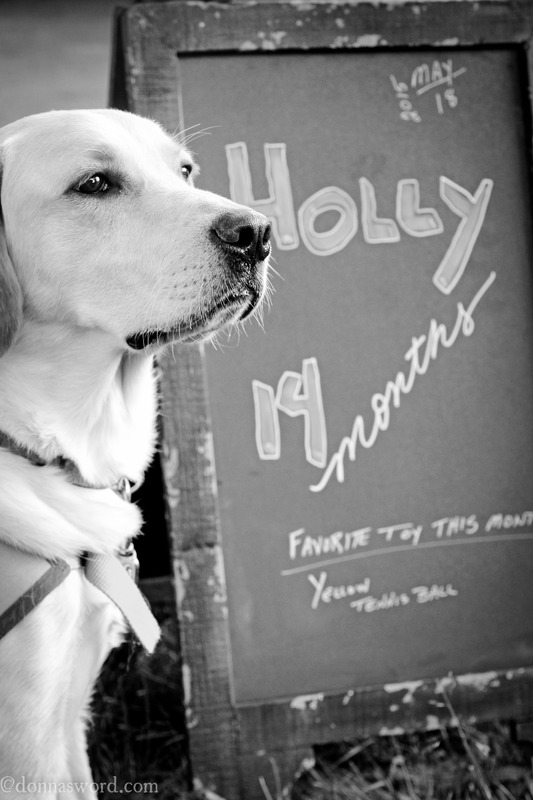 So I guess getting the chalkboard for Holly’s monthly birthday photo shoot should be lower on the excitement meter. Yet, I admit being a little jazzed to have it. And by have it, I mean I commandeered it from the wedding reception. It was on the bar, a chalky sentinel tasked with advertising the choice of beverages available to the revelers. “Let me just put that in my trunk for you guys,” I said to the newlyweds. “You’ve got enough to take home with you.” Because I can be clever like that. It’s not like they’ll never see the chalkboard again, of course. It’s just a hyperlink away. Or a visit back home to see the parents. That too. In hindsight, not sure why I bothered calling out the Yellow Tennis Ball as the toy of the month. It’s always the first choice.